Vol.30.8: PLUS CA CHANGE . . . ? The Rabbit’s manual called for an oil change after 800 miles. That came up when we reached Toulouse. I had the address of the VW dealer there, and left our hotel early one morning to get the oil changed. Alas, the dealership was fermé ; it was a holiday. So we spent another day in Toulouse, and another. On day four I went again and there were still no signs of life at the dealership, except for the two huge Doberman’s that slammed up against the showroom window at face level as I peered through it and scared the merde out of me. Cut to a decade later. I was in Paris teaching at the University and spending the weekend with a French friend at her home in the countryside. As it happened, she was, at that time, preparing an employment application for a job with a French corporation. She asked me to look over the application and I asked why she was writing it in longhand; would not it be easier for the reader if it were typed? She quickly corrected me. It was required to be written in longhand because it would be read by a grapho-analyst as well as others, and the grapho-analyst, who claims to determine different attributes of the writer’s ‘character,’ would have a say in the decision on the application. I was blown away. 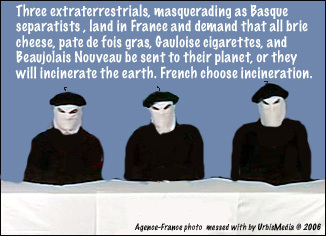 This was France, in the year of the Bicentennaire, and they were making decisions by something that was the equivalent, at least to me, of astrology. Forget to cross a ‘t’ and you might be pegged as an axe murderer. Slant your letter to far to the right and you’re a Fascist. It also happened that I had another French friend whose wife was preparing for her exams in Grapho-analysis. I said I knew little about this “hobby”. Au contraire , grapho-analysts are a ”profession.” How do you write a love letter to a grapho-analyst, I thought. This memory returned when I recently read about the riots at the Sorbonne. Unemployment for French youth is a 22% (40% for the ones in the industrial suburbs that rioted for days a few months ago). PM Villepin’s new proposed law was the issue; it would allow employers to terminate new workers without cause for two years. Seemed rather unfair to me. I’m a union guy, a bit of a leftie, and my sentiments are usually with the workers, not corporations. But I remembered the Rabbit in Toulouse, begging to have its oil changed while the French auto mechanics made merry during some obscure saint’s anniversary. Let’s cut back to the Bicentennaire year for a minute. I was used to teaching a 15-week semester in California, and had prepared such a course for my grad students at the U. Paris. But I hadn’t counted on the French and their holidays. There is first of all a week called the “reading period” in which there are no classes. The students call it the “skiing period.” Then I found that there were another three occasions in which there were holidays for religious or national observance. Usually, the French extend these workless days by doing something they call faire le pont , or “making a bridge” between two holidays with some of their regular vacation days, often adding another one at the end or the beginning, throwing in a sick day—whatever! Before you know it you are renting an apartment in Toulouse because its cheaper than waiting a month in a hotel for a little oil change. Anyway, there wasn’t much left of my semester, but the students didn’t seem to mind—they were preparing to become French workers, or riot, if it isn’t some sort of holiday. So how sympathetic should I be with these rioting students? Even when they do get a job they will retire around age 55, sit around bars and cafés drinking wine, and have national health care to tend to their stressed livers. French farmers and truck drivers will hold the country hostage if they don’t get their protectionist policies or other governmental favors, spoiled as they are. They think we Americans are working ourselves to death. Maybe we are. So who do I “man the barricades” with on this one? This time the protests in the streets are not those of 1968, that fought to liberalize government practices; rather the supposed 70 percent opposed to the proposed law seem to be in favor of retaining the “right” of young French workers to get a job with a “lifetime” sinecure. Perhaps my inclination to throw in with the workers over the capitalists and managers, and their grapho-analysts is based not so much on the plight of workers in France as it is here in the good ole US of A where the Enrons screw workers out of their pensions, General Motors prepares to jettison 35,000 workers and Ford a number of equal magnitude, and Wal-Mart operates like a big-box sweat shop. Even so, employers should be able to replace workers who don’t work out, or just don’t work. Pondering such dilemmas brought me back to my friend’s job application, especially when she told me that she would also have to attach a photo of herself to the application so that, as I interjected, “they can discriminate against you on the basis of your looks.” In the land of liberté, egalité and fraternité! Strange, I remarked, they didn’t ask for a photo of me when I filled out papers for my Professeur Associé post. They even asked me to come back and teach again for them in 1999. And I thought this was a face that only my mother could love. But the French are a bit weird, remember; they like faces like Gerard Depiardieu, not Brad Pitt. The French, I’ll never quite figure them out. Just when you think they are about to do something un-French, . . . plus c’est la meme chose. Actually, at the personal level, I know some very hardworking French persons; but none of them do oil changes. Wait a minute! This is France we are talking about; isn’t it de rigeur to have an affair with the boss’s wife? You will know exactly where this sentiment comes from if you have ever had to register for employment in France, or had a visa problem. And you thought they knew how to do torture at Abu Ghraib.